Nate Whitehill has redesigned his blog and the new theme looks great. He is calling the look Nate Whitehill dot com 2.0. You may also know Nate from one of his other ventures Unique Blog Designs. The blog design venture launched with the redesign of John Chow dot Com and Shoemoney.com and has been going great every since. To make a long story short, I have been too busy working on blogs other than my own over the past nine months and simply have not had time to redesign my own blog, until now. I can certainly understand busy. Up until this redesign Nate had been using a modified version of a free theme called Ocean Mist. He built his new theme from the ground up so that he could do it exactly how he wanted it. 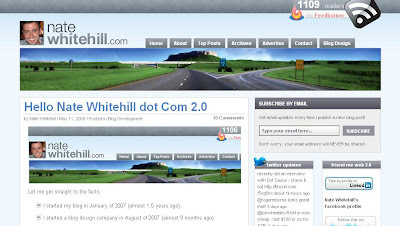 Stop over to his site and read through his article describing the evolution of his blog, the beginnings of Unique Blog Designs, and the process he went through in the redesign of Nate Whitehill dot com. Here is a screenshot of his new blog design. Get more profitable and productive information by subscribing to my FEED or clicking the links below to bookmark my site, or add me to your favorites. Smorty Keeping Up With The IZEA?